Mail from our readers – W.A.P. Are their different religions in Antarctica? All of the churches from your site appear to be Catholic. Are there conflicts or cults of any kind established in Antarctica? some Church is multi-confessional, so that is the case of the Chapel of the snow at US McMurdo Base, other are Ortodox as the St. Kliment at the Bulgarian Base or the Russian Ortodox Trinity Church at Bellinghausen Base. Antarctica is a peaceful place and for sure there are no conflicts of any kind also because it seems ridiculous to fight because of the religion … if I am not wrong, all religions are preacing peace and reciprocal respect! …this is another way to love Antarctica! 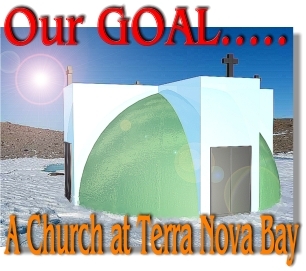 Support WAP Pproject to build a small church to MZS Station at Terranova Bay!